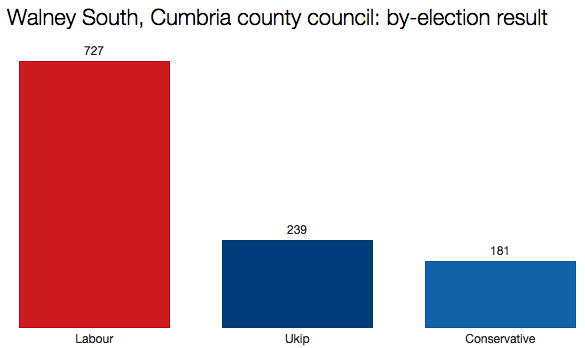 Thursday’s council by-election in Cumbria was almost certainly the last of its kind we’ll see before polling day. No more by-elections are scheduled between now and 7 May. The steady drip of local results, week in week out, is over. The result represents a tiny 0.6% swing from Labour to Ukip. But a comparison with the result in this ward in 2010, on the same day as the last general election, shows a net 10.4% swing to Labour. The Press Association’s analysis of four comparable council by-elections since 26 March suggests a projected 2.9% nationwide lead for Labour over the Conservatives. When I posted yesterday I did not know Lord Ashcroft had just released polling of the 2 Scottish constituencies I have been hoping for. So it was a wonderful surprise to see polling of Fife NE and Berwickshire Roxburgh Selkirk. As I had thought SNP will gain the former and the latter very close between 3 Parties. I am inclined to think Labours Scottish seats will be in single figures. LDs should have 1 or 2 and Cons also 1 or 2 depending on the close contest at BRS. Obviously SNP all the rest.